It can’t get much more obvious than this. The report says ‘it’s a one-two-four-eight resonance’ of the orbits of these massive planets, but we find it’s much nearer to 1:2:4:9, with the outer planet taking 450 years for one orbit. The era of directly imaging exoplanets has only just begun, but the science and viewing pleasures to come are appealingly apparent says Many Worlds. 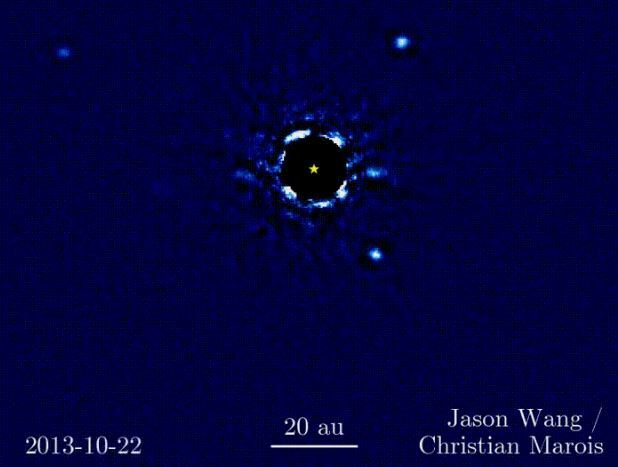 This evocative movie of four planets more massive than Jupiter orbiting the young star HR 8799 is a composite of sorts, including images taken over seven years at the W.M. Keck observatory in Hawaii. The movie clearly doesn’t show full orbits, which will take many more years to collect. The closest-in planet circles the star in around 49 years [report incorrectly says 40]; the furthest takes more than 400 years. But as described by Jason Wang, an astronomy graduate student at the University of California, Berkeley, researchers think that the four planets may well be in resonance with each other. In this case it’s a one-two-four-eight resonance, meaning that each planet has an orbital period in nearly precise ratio with the others in the system. The black circle in the center of the image is part of the observing and analyzing effort to block the blinding light of the star, and thus make the planets visible. With a 1:2:4:9 system the number of conjunctions of neighbour planets (in any given period) is in the ratio 1:2:5. Just looking at the 1:2:4 part of the system the conjunction ratio is 1:2:3, as it is with the Galilean moons of Jupiter. In reality the ‘9’ part of the system is only about 98.6% accurate, but close enough to be interesting. however planets form, are you saying so far there are two observable patterns? with two caveats? the sample size is too small, and some are moons orbiting planets and others are planets orbiting stars? Hank – it’s about the stability of the system. Resonances of the ‘wrong’ kind cause problems e.g. the Kirkwood gaps in the asteroid belt. There are different types of resonances. The one described above is mean motion resonance. In the solar system we have the planetary examples of Neptune and Pluto (3:2 orbit ratio) and Earth and Venus (8:13). The orbital mechanics of Sun-planet and planet-moon are very similar. One of the interesting things is the distance these resonances are operating over. HR 8799’s outermost planet is 68 AU from its star i.e. 68 times the Sun-Earth distance. It’s official – Vancouver’s snowmageddon has been recordbreaking!